Amazon's one-day mega deal offers £10 off purchases over £50 but for today only! We love a good Amazon voucher code and we love the great ones even more! To celebrate being ranked #1 for customer satisfaction for the fifth time in a row by the UK Customer Satisfaction Index, Amazon is officially offering £10 off every order over £50 until midnight tonight with voucher code: BIGTHANKS. Of course, let's give this gift horse's mouth a quick once over. We're happy to report that restrictions on what you can use the discount for are pretty minimal. Here's the official blurb: "The £10 off £50 offer is available on products sold by Amazon retail including Amazon Fresh, Amazon Pantry and Prime Now. It cannot be redeemed for selection product [SIC] such as those sold by third-party sellers on Amazon Marketplace, Amazon Gift Cards, video games, baby products or digital content." So yeah sorry, no discounting Amazon Prime membership or Red Dead Redemption 2, for example but it does working on gaming hardware and games that are already out (we've tested this). Modest selection of restricted items aside, just make sure your total basket comes to £50 or more and use the Amazon voucher code below to knock £10 off. Don't forget, the items must be sold by Amazon itself and not a third-party store, so just look out for a bit of text a few lines underneath the price saying something along the lines of, "Dispatched from and sold by Amazon," and you'll be good to go. 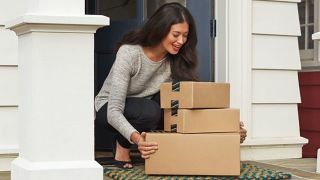 "We really appreciate the positive feedback from customers and we will keep working hard to meet the high standards our customers expect from us,” said Doug Gurr, Amazon's UK Country Manager. Cheers, Doug! Right, let's see what deals we can find.